What do you think the value of copywriting is to your business? It’s probably more than you think. What about the value of each of the pages on your website – how much are they worth in terms of what they do for your business? If you haven’t thought about your website in this way before, you might want to start today. The invoice for the website is the usual measure most businesses place on their online presence. I.e. they think of the website as a COST to the business. Let’s say you have an old product description that just uses the boilerplate copy from a manufacturer. It’s very likely that it’s not working well for you. There are countless others out there with the same copy and your repeat version is simply doing nothing to differentiate you from the competition. If you produce a unique piece of copywriting for that product, you can measure the change (increase) in conversions. You’d see immediately what the value of that single piece of content is to your business over a day, a week, a month and over a year. Rinse and repeat across all your content and you get an idea of how valuable each page – and the site as a whole – is to your business. Google and other search engines thrive on the ‘free’ content everyone creates. Content keeps it in business. Essentially, we open up our content to Google for the chance to get found in their index and receive the benefit of qualified traffic. Do you know how many visitors from Google converted to paying customers last year? How much did your online marketing cost to get them there? Divide the cost by your converted Google traffic and you get your CPA for the channel called Google. 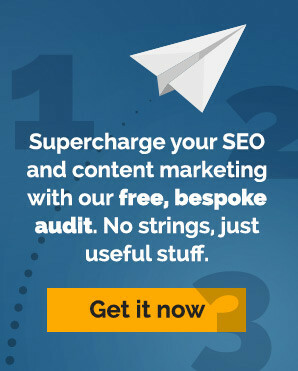 It’s not ‘free’, but you can improve its value through better SEO copywriting. It is possible to measure the value of every piece of content you produce. In her post The Value of Content Part 2, Melissa Rach maps it out for us. Her example (point 3 in the post) is brilliant. It assigns a monetary value to a piece of instructional text and the costs of repairing this content. It’s very easy to do this kind of analysis across each of your pieces of content to see what the real value of copywriting is. When you think about it, putting a value to your online marketing just makes good business sense. Measure the value of everything. If your content isn’t working, change it or get rid of it. Thanks for the mention Derryck!